I’m not going to Grand Prix Charlotte this weekend, but if I were, I’d be playing Blood Moon. Moon is one of those bizarre 8th and 9th Edition holdouts from an earlier era of design: unique, powerful, and totally out of line with contemporary development principles. It’s in the same category as Choke, Ensnaring Bridge, Storage Matrix, and a variety of other oddball effects. Blood Moon is the strongest of the lot, standing in a league of its own as one of the best sideboard cards in Modern. With GP Charlotte on the horizon, Moon is looking like one of the most powerful cards you can bring, both in the maindeck and the sideboard. In this article, I discuss different ways you can put your opponents under the Moon’s glare. Because Moon is such a compact threat, it’s an easy fit for most two-colored red decks, or even three-colored red decks under the right circumstances. But Moon isn’t just something you can jam into your 75 and hope for the best. This article gives you a few examples of decks that put Moon to good use in either the sideboard or maindeck. I start with a quick assessment of Moon’s impact on Modern, looking over metagame data to ensure that Moon really is as good as it seems. Then we’ll look at the lists. In the end, this will arm players with the knowledge they need to wield (or prepare for) Moon at the GP. Back in April, I wrote about a data-driven framework players could use to evaluate Lightning Bolt’s relevance in any given metagame. At some point in time, it would be interesting to conduct a similar analysis for Moon, developing matchup criteria in which Moon shines and then weighing the subsequent “Moon index” for each deck in the format. But for now, we don’t need to go into that level of detail. Just looking at metagame stats from the last 4-5 weeks, we already have more than enough datapoints to support Moon. Modern has a number of top-tier decks and strategies that make Moon strong and those matchups alone warrant its inclusion. By far the most important reason to run Moon is the Amulet Bloom deck. We’ve been tracking this deck for months now and I’ve already used MTGO data (part 1 and part 2) to show it’s the deck with the highest win rate in the format. It’s the only deck with a match win percentage that is significantly (statistically speaking) higher than the average Modern deck. Everyone else has a win percentage hovering around 47%-53%. Amulet Bloom? 60%, with a P value of .02, suggesting that this deck is truly above average by every statistical standard. In many respects, SCG Columbus affirmed these findings. Bloom was the most-played deck between the Last Chance Qualifiers and the Invitational 7-1 or better decks. It was also the only deck besides the metagame-specific RG Tron to send two representatives to the Top 8. This is yet another chapter in Bloom’s format-breaking history, following its stunning overperformance at Pro Tour Fate Reforged and again at GP Vancouver (although the latter finish was marred by later cheating allegations towards a noteworthy Bloom pilot). Couple that with the deck’s win rate at the PT and we have a consistent picture of Bloom being Modern’s best deck. It’s impossible to talk about Amulet Bloom without attracting hordes of concerned Modern citizens who either clamor for a Bloom ban or rage against one. So none of this is to weigh in on that debate (seriously: at least wait until the end of June). It’s only to say that Amulet is a very good deck that you must be able to beat at GP Charlotte. Indeed, a big part of Bloom’s strength is in players not knowing how to beat it. Watching people play against Amulet, even on camera and even among pros, is like watching a Dredge matchup in a middle school cafeteria. People just have no idea how to beat it, what it’s capable of, or where its weaknesses lie. So this is definitely at play in Amulet Bloom’s high win rate. But then again, the deck is also just very strong. It’s resilient to disruption, presents limited interaction points, and is linear enough to ignore most gameplans and stick to its own thing. Even if you know all the ins-and-outs of the deck, you will still need firepower to beat it. That’s where Moon comes in. If you land it against Bloom, the game will virtually end on the spot, especially if Moon is backed up by even a modicum of pressure. Given Bloom’s metagame share and win rate, you need to be prepared for the deck and Moon is the best answer we have. The second reason to play Moon is BGx. SCG Columbus and the other early June events showed that the Jund vs. Abzan debate is by no means decided. Although I still believe Jund has the metagame edge, I have also tried to explain that it’s not a cut and dry issue of one deck supplanting the other. We have already seen the two decks coexist for months now, and that doesn’t look like it’s stopping anytime soon. Be prepared for both. But no matter where you stand in the debate, you still have to admit that Moon is a great card against these decks. It’s gamebreaking against Abzan and strong against Jund, which is exactly where you want to be against a combined archetype share of 15%+ of the metagame. If you go to Charlotte, you will face Jund and Abzan. It’s hard to say which of the two decks will be more prevalent: Jund just surpassed Abzan online, but Abzan still has a 2%-3% lead in paper. No matter which deck emerges on top, Moon will be a strong card here (especially if players on Abzan, a softer deck to Moon, think they can retake the metagame into this Grixis heavy field). Finally, Moon is a big red wrecking ball against a lot of random Modern decks. This is exactly the type of card you want to play in a diverse format at a large event, much like Spellskite, Dispel, Thoughtseize, and the other bullets of Modern. Moon is relevant against RG Tron (land destruction is better but Moon isn’t the absolute worst thing you can do), Zoo variants, UWR variants that fetch poorly, Infect, anyone still playing Scapeshift, and even Grixis decks if you get the initiative in playing it first. 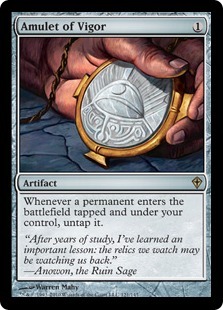 Catchall cards are incredibly valuable in Modern, a format filled with strong decks demanding narrow answers. Moon picks up a lot of slack in this metagame. Just looking at the decks listed above, both in this paragraph and including BGx and Amulet decks, you’re looking at a solid 40% of the format (and about 60% of the tier 1 and tier 2 format). That’s a lot of matchups where Moon is strong, and good incentive to use the card in some capacity. The sideboard is Moon’s most obvious home. If you run Moon out of the board, you don’t have to worry about drawing it in game 1 against the numerous Modern decks where you don’t want to see it. In fact, this is an important followup point from the above discussion of Moon’s relevance. When Moon is good, it’s really good. But when Moon is bad in game 1, it’s really bad. This is not a card you ever want to draw in your opening 7 (or, Urza forbid, mulliganing into it on 6) against Affinity, Merfolk, Burn, Abzan Company, Elves, or UR Twin. Although these matchups don’t detract from Moon’s metagame strength, they do detract from its maindeckability. They also punish those decks who try to hedge bets too heavily on Moon. Given that these above decks make up a combined 28%-30% of the format, Moon’s safest place is off in the sideboard where you can use it only if you need it. Here are two decks you want to take as examples for effective Moon sideboarding. Although other decks use Moon in the board, these two are notable in their radically different gameplans and in how Moon interacts with those plans. First, let’s look at Brandon Pascal’s Affinity sideboard from the SCG Invitational. If you are playing an aggressive deck like Affinity, this is the way you want to run Moon. Generally speaking, Moon doesn’t play nice in multiples, which is one reason most lists run no more than 2 copies for games 2 and 3. On the one hand, you want to draw this card by turn 2-3. On the other hand, you don’t want to see two of these in a game, especially if the opponent hasn’t addressed the first one and your gameplan is so linear that a drawn Moon will disrupt your momentum. That’s where the rest of Pascal’s board comes into play, giving you overlapping answers in matchups where you also want Moon. Against Amulet, you have Thoughtseize, Spellskite, and Grudge. Against BGx, you have Champion and Spellskite. Control decks fall to Thoughtseize and Pierce. This kind of mixed hate is common in most current Modern sideboards, but it’s particularly important with Moon. If you don’t have Moon in key matchups, those other cards need to keep the game going until you get it online. All of this is to say that Moon can’t be your only card for certain matchups (nor can you just go all-in on 4 Moons). You need those other slots to remain flexible. Grixis Twin plays a totally different game from Affinity, but its sideboard structure is similar to the aggro deck’s. We see a pair of Moons along with a variety of singleton bullets. Some cards are the same ones we saw in Affinity, or at least filling the same role (e.g. Spellskite, Thoughtseize, Anger). Others fill different gaps in the Grixis Twin gameplan that Affinity wouldn’t need to worry about (e.g. Keranos, Olivia, Claw). But again, the key takeaway is that you don’t create a sideboard with 4 Moons and call it a day. Those 4 Moons won’t necessarily be effective in your targeted matchup, and they eat 2 slots that could be put into preparing for a more diverse array of decks. As long as your other sideboard cards pick up the slack of a missed Moon, you won’t notice the missing copies. 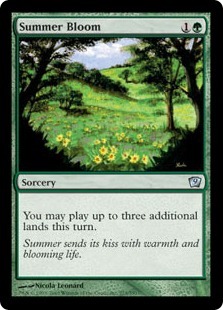 Is there ever a situation where you want to run 3 Moons in the sideboard? Yes and no. There are definitely times where you will run 2 Moons in the maindeck and have a 3rd in the board (see the next section for more on this configuration). And there are also times where you will straight up run 3 Moons without a single one maindecked, even though this is definitely the exception. The only instances where I think this is fine is if you are running fast mana to drop the Moon on turn 2 (the earlier Moon lands, the better), or if you are playing a deck that has such an awful BGx and Amulet matchup that you need an early Moon. Grixis Delver might be in this latter category: its Amulet matchup isn’t amazing and it’s BGx matchup goes from bad (Jund) to unwinnable (Abzan). Delver gains a lot from Moon in certain matchups and can afford the sideboard slot to shore those up. But outside of these cases, you really want to stick with 2 copies of the enchantment. In a metagame with so much Jund, Abzan, RG Tron, Amulet Bloom, etc., Blood Moon starts to look like an attractive maindeck option. As i said at the start of this article, although I’m not going to GP Charlotte, I would be playing Moon if I could attend. And if I played Moon at Charlotte, it would be in my maindeck. There are several advantages to running a game 1 Moon that you lose in the sideboard. The big one is the very reason we are running Moon in the first place: Modern is defined by high-impact cards that provide narrow answers to important matchups. When you bring in those cards (e.g. Moon, Stony Silence, Leyline of the Void, etc.) in games 2 and 3, you are often bringing them directly into their answers. Savvy players will be ready with Nature’s Claim, Wear // Tear, Thoughtseize, and other ways to handle these threats and continue their gameplan. But if you get ahead of the curve in game 1, your Moon will get a full game to shine without worrying about the hatred lurking in the board. Just as decks like Affinity and UW Tron excel in game 1, so too does Moon: the answers just aren’t ready yet. If you want to maindeck Moon in Modern, look no further than Grixis Moon, aka Grixis Control, aka Not-Your-Parents’-Cruel-Control. Blue Moon strategies, and Temur Moon to a lesser extent, have been Modern staples for years. Straight UR control decks are natural fits for Moon, as UR Twin’s performances at PT Fate Reforged and GP Vancouver attested. But the Grixis Moon concept appears, by its very nature, to be riskier. Fetchlands and shocklands are required for Grixis to work at all, and the deck makes extensive use of black spells (unlike Temur Moon which really just splashes for Goyf). This makes Moon seem like an odd inclusion. But as Gerard Fabiano proved en route to his 11th place finish, maindeck Moon is just as strong in Grixis Moon as it was in the Blue Moon predecessors. Matt Costa also ran a similar list to Fabiano’s, but I prefer the above 75. Fabiano’s finished higher, maindecks Inquisition, and doesn’t have any nonsense with Vedalken Shackles in a metagame where Kolaghan’s Command is probably in 30% of decks. Looking at this above list, we see a number of deckbuilding decisions made to accommodate maindecked Moons. The first is in the manabase. Fabiano is up to 6 Islands and zero manlands or utility lands. That means no Desolate Lighthouse or Creeping Tar Pit, which isn’t the end of the world but is still a loss you might feel as games drag on. But those cards don’t play nice with Moon so out they must go. 6 islands is also mandatory here if you ever want to cast those Cryptic Commands or flashback stuff with Snapcaster. The second deckbuilding parameter involves two-colored cards. Some Grixis lists run extra copies of Electrolyze, in addition to the almighty Terminate. Fabiano avoids those cards as much as possible. It’s not realistic to go turn 1 Scour/Visions into turn 2 Terminate and turn 3 Moon. That mana configuration is too specific to rely on. To adjust for this, Fabiano runs a full 3 Cuts, which you typically don’t see in Grixis decks that aren’t running Moon. A more traditional split is 2-1 on Terminate-Cut, but that just doesn’t work when you also have 2 Moon. I don’t think Cut is actually better than Terminate here: it’s just the price you have to pay to maindeck Moons and keep removal. But even if Cut is worse than Terminate, Cut plus Moons is probably better than Terminate and no maindeck Moons. This is the kind of calculus you need when building around the enchantment. Ultimately, if you include Blood Moon in a three-colored deck, Fabiano’s list is a good starting point to give you deckbuilding guidelines. Go heavy on the basics, ditch manlands and utility lands, and adjust spells to accommodate an active Moon. Although this might mean playing subpar options (e.g. Cut instead of Terminate), these other cards aren’t often that much worse than the regular choice. Besides, anything you lose from running Cut over Terminate or 1 Electrolyze over 2 is more than compensated for in the maindeck Moon. Confession time: I’m not the biggest fan of established tier 1 and tier 2 decks. Although there are some I can get behind and play, I much prefer to run something a bit less mainstream and a lot more unexpected. Moon is right at home in such a strategy, because your opponent both has to respond to your unconventional gameplan and play around the Moon. Most players (even pros) struggle to just do the first, so adding Moon on top of this can be a recipe for success. This would have been a frontrunner deck for me if I headed to Charlotte this weekend (with some more testing and tweaks, of course). The Griselbrand/Emrakul and Vengeance/Breach package is one of the strongest things you can do in game 1 in Modern, especially against decks that aren’t interacting with you. BGx decks have been a historic weakness for Griselbrand, both due to the spot discard ripping apart your hand on turns 1 and 2, and later Ooze keeping cards out of your graveyard. But adding the threat of a turn 2-3 Moon makes this matchup a lot better, giving you more early game threats and topdeck power. As I said earlier, there are a number of slots you can play with here (I’m not sold on the 3 Prisms, even if they do make Breach a lot more reliable), but this is a great starting point for the deck. It’s also an effective way to illustrate how you would integrate Moon into rogue maindeck shells. The second way to go rogue with Moon is to build a deck around the card. Looking at this site alone, Sean posted an RW Kiki Control list that used Moon as one of its many disruption pieces. You could also do something cute with a 6-8 Moon list, using Magus of the Moon to add more nonbasic hosing to the maindeck and all but ensure active Moons by turn 3. I’m generally not a fan of this approach because it’s hard to get the rest of the deck working even with Moon. It’s much easier to take an existing tier 3 deck and improve it with Moon than it is to try something new around an enchantment that might not even carry enough games: remember that a good chunk of the metagame is basically Moon-proof. But it’s still a viable option if you have enough time to test and tune. It’s no coincidence that Moon’s price keeps rising with its metagame relevance. As I’m writing this article, the card is already over $50, a 100% price spike we’ve been riding since Moon was confirmed out of MM2015. If Moon does well this weekend (which I’m betting it will), expect for this to keep rising (but hope for it to fall, because this is an absurd pricetag for this kind of card). Overall, the metagame is ripe and ready for a Blood Moon takeover and hopefully this article gave you some new ideas for using the card to take down the competition. So sleeve up those Moons, put down some pressure, and show those Bloom and BGx mages that trouble is on the way. “should you mulligan a great hand with no Nature’s/Seal”? Of course not. If it is that good, you simply keep it . Then a gamble begins. If a player has Blood Moon and throw it onto the battlefield, you go into a topdeck war and hope to find a basic Forest. Real magic has ended now. It’s like calculating possibilities in order to find Forest(just like poker). You want a pair of asses and the possibilities are highly in opponent’s favor. Anyways, I am happy that there is a HARD counter on us, Amulet players and due to that fact, a likely ban is and should be high off the cards. 2) Why Emrakul on your list? When do you get to play it? Just wrote to share some thoughts about it from my experience. The most common way to play Emrakul from his list is through Goryo’s Vengance or Through the Breach – both are instants. When you can find a way to discard Emrakul (faithless looting being the most common way), you can respond to the shuffle trigger with GV/TTB and cheat Emrakul into play. Overall on the article Sheridan – looks good, and agreed with your assessment so far with Blood Moon and how it fits within most deck frameworks, especially with having them main deck and side boarding it out. Happy to hear you liked the article! I think it’s important for more authors to discuss deck frameworks and decisionmaking as much as decklists and cards themselves. Moon is really interesting in that regard and I had a lot of fun thinking through this. 1) Your experience with Moon is what I’ve heard from a lot of other players. Sometimes, hate cards aren’t that good against the decks they are supposed to hate. We saw this a lot against Burn when people tried to use Leyline to beat a deck that gets most of its damage from creatures or non-targeting spells, or players who relied too heavily on Dragon’s Claw without realizing that Revelry and Smash to Smithereens were coming in. But Moon is the real deal against Bloom. 2) Emrakul gets cheated in via Breach. You can also discard Emmy to Charm or Looting and, while its shuffle trigger is on the stack, reanimate it with Vengeance. I don’t know, if I was going to Charlotte I would just go in with the strongest non-Amulet deck in Modern right now (which is Grixis Delver, by far) and sideboard primarily against the former and maybe a couple of the weaker matchups, because heading into big events you need a diverse sideboard, unlike what you would pack at FNM level. Even then I doubt I would have Blood Moon in my side, because to accomodate a Moon plan into the deck you have to cut off power in other places, primarily the mana base. I’m not sure giving up (let’s say) another 2 of your really close matchups in favor of the blowout against Amulet is worth it, especially when there are other linear ways to fight against that deck.